PA President Mahmoud Abbas spoke about Israel's claim to land obtained before 1967 and touched on the PA's UN bid for statehood. In an open letter penned to the residents of Gaza, PA President Mahmoud Abbas spoke about Israel's claim to land obtained before 1967 and touched on the PA's upcoming request from the General Assembly to grant it "super-observer" status, writing on his Facebook page, "Our land was conquered and it is not disputed territory and this is true of all of the land that Israel conquered before June 1967." 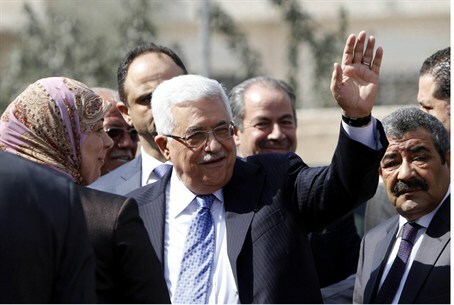 Abbas' statements were repeated in official PA media and translated by Palestinian Media Watch. "The recognition of [the State of Palestine at the UN] will not free the ground the next day, but it will prove our just cause that our land is occupied and not disputed territory, and this is true in regards to all of the territories Israel occupied before June 1967." "I want you to know that this is a great political and diplomatic campaign, and I regret that some Palestinian voices do not understand or do not want to understand the importance of it," wrote Abbas. This letter comes only weeks after Abbas secretly met with Defense Minister Ehud Barak in Jordan, focusing on efforts to resume peace talks. Yet the PA's public opinion that all land prior to 1967 is now "occupied territory" is nothing new. Last Independence Day PA officials spoke on television, saying, "Today, 64 years ago, the Israeli Zionist gangs committed the broadest deportation actions against our people in the occupied lands in 48." Palestinian Authority newspapers commonly refer to certain officials as "leaders of the Palestinian territories occupied in 1948."